What is an SSCC Code? SSCC stands for Serial Shipping Container Code and is recognized internationally as a shipping code for containers and pallets. Each pallet is to be assigned a unique SSCC, displayed in text and barcode form on the matching SSCC label. Using this code, it is possible to track and trace the pallets and containers all across the globe and maximize the optimization of the logistic process. In common practice the SSCC label is combined with an EDI message, specifically the DESADV message which can be automatically matched to the SSCC. This message provides extra information on the shipment when the SSCC code is scanned. What does an SSCC Label look like? An SSCC label is most often printed on A5 format and consists of 3 sections. The section at the top of the SSCC label can be used for free text. The sender can use this to, for example, place the address of the recipient. The second section contains information in a human-readable format, examples are the batch, content, best before date and the SSCC code itself. Everything that’s represented as a barcode on the label should also be in this section. The third and last section of the SSCC label is where the barcodes are placed. In accordance to the GS1 Standard the barcodes can contain a multitude of information. Best practice is, that when more than one barcode is present on the SSCC label, the code is represented in the bottom barcode. The logistic processes surrounding SSCC labels can be broken down into four parts, shown below. 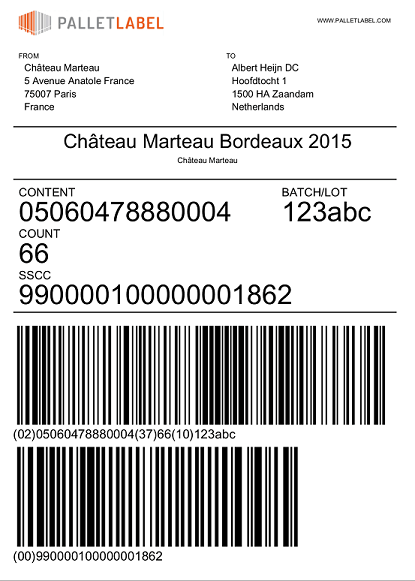 The sender uses a SSCC label generator to create a GS1 label with barcode(s). This label is then applied to the container or pallet. The sender sends out a digital dispatch message via EDI (electronic data interchange) to the recipient of the pallet. This is done using the international standard called EDIFACT, making global interactions more accessible. The dispatch message fits in this standard, provided by GS1, under the name DESADV (dispatch advice message). This message contains information on the shipment, such as the corresponding order message, the number of pallets and which products are placed on which pallet. This gives the recipient a clear overview of what will be delivered. The SSCC can be used to trace the delivery globally as it’s scanned at various points of shipping. The recipient receives the shipment and scans the palletlabel, which picks up the linked EDI DESADV message. Directly clarifying the contents of the pallet or the container. What are the advantages of an SSCC Label? Quality demands and legislation are met. How do I create an SSCC Label? There are multiple ways of generating your own SSCC Label. There are various WMS and ERP systems that have the capability of generating an SSCC. These systems also offer the possibility to receive and link EDI messages to the SSCC codes. When a shipment arrives, only the palletlabel has to be scanned to view the contents of the pallet. This automates and optimizes the receiving of goods. Another approach to creating your own SSCC label is using the SSCC Label generator of Palletlabel.nl. Experience the ease of the Palletlabel SAAS solution by generating a demolabel using our Palletlabel-demo tool. At Palletlabel we offer several subscriptions to relieve the logistic burden. Whether you need 20 SSCC labels a month, or over 500, at Palletlabel you’ll find a subscription plan suitable for the size of the business. Starting from € 40-, a month the Palletlabel SAAS solution helps companies optimize their logistics. Curious which subscription would fit your company best? Fill in our price calculator now and find out which plan would be most beneficial. Prefer an on-premise SSCC Label solution? Our on-premise One2Label Automation solution enables you to quickly and automatically print out SSCC labels based on data from your WMS and/or ERP systems. One2label Automation is fast, efficient, prevents user input mistakes and links up seamlessly with your logistic processes. Aside from SSCC labels it’s also possible to print box and product labels. Experience the ease of our on-premise solution One2Label Automation by generating a demo box label with our one2label demo tool.